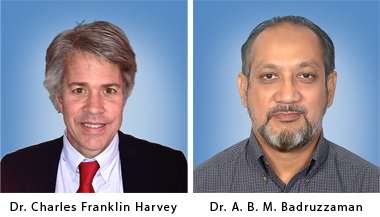 The team of Dr. Charles Franklin Harvey (Massachusetts Institute of Technology, USA) and Dr. Abu Borhan Mohammad Badruzzaman (Bangladesh University of Engineering and Technology, Dhaka). The prize is awarded to this team for developing a complete diagnostic and conceptual model for understanding and preventing the arsenic contamination of groundwater. They have followed one of the most important groundwater contamination cases known, the arsenic contamination of the groundwater in the Ganges Delta in Bangladesh. This contamination was recognized some 20 years ago, and this team began early on to investigate the case. Their specific, original approach soon made clear that dissolved organic carbon was one of the main causes, and they started to address the carbon sources. Step by step, their research led to a more and more complex view of the mobilization to the deposition of arsenic in a complex aquifer system, influenced by different land use activities, like rice field irrigation and sewage disposal. At each step, their investigation led to more and more detail, solving part of the puzzle and raising more detailed questions, which in turn led to further, more detailed research. This group gives an excellent example of the application of scientific methods to solve a specific problem, following the issue for more than 10 years until arriving at a plausible, yet stunning result, which not only answers a major puzzle in groundwater hydrology, but which more generally demonstrates that complex natural systems can be understood. Dr. Charles Franklin Harvey is Full Professor of Civil and Environmental Engineering, Massachusetts Institute of Technology (MIT). • Ph.D. 1996; Stanford University, Geological and Environmental Sciences. • M.S. 1992; Stanford University, Applied Earth Science. • 1987-88; Ohio State University, School of Medicine. Completed first year of medical school (MD) with honors. • B.A. 1986; Oberlin College, Mathematics. 2010: Science Prize for Online Resources for Education, American Association of the Advancement of Sciences (shared) for the Harvard-Smithsonian environmental science curriculum, The Habitable Planet. 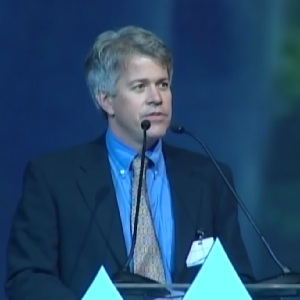 2008: M. King Hubbert Award, 2008, National Groundwater Association (NGWA) prize for major science or engineering contributions to the groundwater industry. Dr. Abu Borhan Mohammad Badruzzaman is Professor of Civil Engineering, Bangladesh University of Engineering and Technology (BUET), Dhaka. • Ph. D.; (University of Virginia,Civil Engineering. • M. Sc. ; Bangladesh University of Engineering and Technology, Civil Engineering. • B. Sc. ; Bangladesh University of Engineering and Technology, Civil Engineering. I thank His Royal Highness Crown Prince Salman Bin Abdulaziz Al Saud, His Royal Highness Prince Khaled Bin Sultan Bin Abdulaziz, and the prize council for recognizing our work in groundwater hydrology. It is a great honor to be in Riyadh and receive the prize. I would also like to thank you more generally for creating and administering these water prizes. Your work is helping to advance important water-related research by recognizing successful projects. I am pleased to be counted with the exceptional researchers honored this year, and I look forward to seeing who receives prizes in future years. It is a pleasure to share this prize with my long-time friend and colleague Dr. Borhan Badruzzaman. We owe our successes to the hard work of many talented graduate students and post-docs. We have also benefited greatly from the generosity and wisdom of many colleagues in Bangladesh, the U.S. and other countries. Tens of millions of people drink groundwater in Bangladesh with very dangerous levels of arsenic, concentrations that limit children’s development and cause disease and death throughout the population. Recent epidemiological work in one area of Bangladesh indicates that one-fifth of all deaths in that area may be attributed to arsenic. This is ten times worse than we originally thought when we began our research a decade ago. If media attention were proportional the importance of an issue, we should now see ten times the concern. Unfortunately, I think we are seeing less public concern, perhaps because the arsenic problem is viewed as an old story. Dr. Gadgil’s research, honored by the Creativity Prize, and our work nicely compliment each other: His work provides immediate practical solutions for providing safe water; our research is directed towards explaining the high contamination of arsenic in well water. Why are arsenic concentrations so high? Where does the arsenic come from? These questions still remain only partially answered. We know that arsenic was weathered from minerals in the Himalayas, then transported in the sediment load of the Ganges and Brahmaputra rivers to be deposited in the flood plains in Bangladesh and West Bengal. Now, groundwater arsenic concentrations are high in these regions because, after the sediments were buried beneath more accumulating sediments, the geochemical conditions shifted, mobilizing arsenic from the sediments. The quantity of arsenic is not particular large in the contaminated areas, rather there is just a large proportion dissolved in the water relative to the solid phase, creating toxic concentrations. The same processes appear to be occurring the Mekong, Red River and Irrawaddy basins. Three important questions for safe drinking water are: Will arsenic concentrations change over time? Will we change arsenic concentrations by pumping groundwater or by changing recharge chemistry by constructing ponds and rice paddies? Can we manage the groundwater resources to avoid pumping water with high concentrations for drinking? At our field site in Bangladesh. we learned that groundwater arsenic concentrations can be effected by both land-use changes and groundwater pumping. Specifically, we have shown that recharge drawn through constructed ponds can elevate arsenic concentrations, whereas irrigation return-flow from rice fields can decrease arsenic concentrations within the aquifer. These differences between the sources of recharge create the pattern of groundwater quality observed at our site, where low-arsenic water from rice fields overlays a high-arsenic water as it is drawn laterally through the aquifer towards irrigation wells. These results are supported by a variety of hydrological and biogeochemical measurements, modeling exercises, and large-scale field experiments, including recently the construction of a lake over an aquifer in which one hundred sampling wells were pre-installed. The results demonstrate the effects of man’s activities on arsenic concentrations, but the final conclusions are complex: In some places arsenic is being flushed from aquifers faster than it is mobilized, in other places input of labile organic carbon from the surface is now mobilizing arsenic, and in other places input of oxic recharge from rice fields is immobilizing arsenic. Arsenic is being transported, flushed, mobilized and immobilized! The net effect varies from place to place. But, understanding of these processes provides guidance for where wells can be placed, and how deep wells need to be drilled to extract safe water. In Bangladesh, in contrast to the US, millions of people continue to drink water that they know is contaminated because they have no alternative. In the developing world, many problems of water supply and quality are similarly immediate. I hope that our work will lead more hydrogeologists to consider field research in developing countries, and that these hydrogeologist will let important problems, not their tools, drive their research directions. Solving water quality problems requires flexible research approaches that may combine hydraulic measurements and biogeochemical measurements, reactive transport modeling and large-scale field perturbation experiments, isotope geochemistry and geophysical measurements. Our recent work has even taken us into carcinology, the study of crabs, after we found that most of the flow through the bottom of our pond was through the burrows of terrestrial crabs. Pick important questions in the real world and let these questions drive the methods. 1. C. F. Harvey, Christopher H. Swartz, A. B. M. Badruzzaman, Nicole Keon-Blute, Winston Yu, M. Ashraf Ali, Jenny Jay, Roger Beckie, Volker Niedan, Daniel Brabander, Peter M. Oates, Khandaker N. Ashfaque, Shafiqul Islam, Harold F. Hemond, M. Feroze Ahmed. (2002). Arsenic Mobility and Groundwater Extraction in Bangladesh, Science. 2. Christopher H. Swartz, Nicole Keon Blute, Borhan Badruzzman, Ashraf Ali, Daniel Brabander,Jenny Jay, James Besancon, Shafiqul Islam, Harold F. Hemond, and Charles F. Harvey. (2004). Mobility of Arsenic in a Bangladesh Aquifer: Inferences from Geochemical Profiles, Leaching Data, and Mineralogical Characterization. Geochimica et Cosmochimica Acta, 68, 22, pp:4539-4557. 3. Charles F. Harvey, Khandaker N. Ashfaque, Winston Yu, A.B.M. Badruzzaman, M. Ashraf Ali, Peter M. Oates, Holly A. Michael, Rebecca B. Neumann, Roger Beckie, Shafiqul Islam, M. Feroze Ahmed (2006). Groundwater Dynamics and Arsenic Contamination in Bangladesh, Chemical Geology. 4. Rebecca B. Neumann, Khandaker N. Ashfaque, A. B. M. Badruzzaman, M. Ashraf Ali, Julie K. Shoemaker and Charles F. Harvey. (2009). Anthropogenic Influences on Groundwater Arsenic Concentrations in Bangladesh, Nature Geoscience. 5. Rebecca B. Neumann, Allison P. St. Vincent, Linda C. Roberts, A. Borhan M. Badruzzaman, M. Ashraf Ali, and Charles F. Harvey. (2011). Rice Field Geochemistry and Hydrology: An Explanation for Why Groundwater Irrigated Fields in Bangladesh are Net Sinks of Arsenic from Groundwater. Environmental Science and Technology.